Do I take PADI eLearning, Referral or Traditional Version for my Padi Scuba Diving Course? You have three choices on how you make the PADI Open Water course with Easy Divers in Protaras, Cyprus.What’s Padi Traditional Teaching? Traditional means you come to ours dive centre, for the complete course theory. Theory includes reading your manual and completing all five sections of the manual including knowledge reviews, this can be done before you start your course. Each knowledge review corresponds to each section of the manual and must be checked carefully by your instructor.In the classroom you will watch the new version of the Padi Openwater Course DVD 2014; this is the latest DVD video from Padi and MUST BE VIEWED!The DVD has five sections that correspond to the padi openwater manual. Once you have viewed each section you will be tested with a quiz. 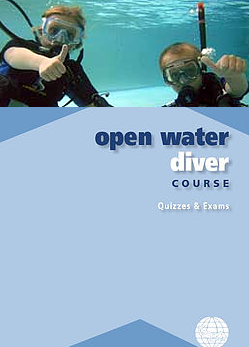 There are four quizzes and the last is the padi openwater exam. You will need to score at least 75% on each section and the padi exam.The Padi Open Water Course Cyprus sections consists of four open water dives, thats why we call it the Open Water Course! You must complete at least four openwater dives past a minimum depth of 5m and to a maximum of 12m for Padi Junior Open Water Divers and 18m Maximum for grown ups. If you have been referred from another padi dive centre or padi scuba instructor, this is the meaning of referral. They need to give you a Padi Referral Form, on which the padi instructor signs off the section you have completed and passed. Now, some students only complete the theory and exams only like Padi eLearning. While others complete the Padi Referrals with all sections completed, all the theory plus all five section of the confine water training. This would only leave four openwater dives to complete.Depending on the type of referral you have will depend on the amount of time you need to complete the course and the cost. If you enrol, you MUST enrol through our store (Easy Divers Protaras, Cyprus Dive Shop – Store Number 32042) in order to complete the scuba course at our location in Cyprus. This allows us to track your progress, view your completion and streamline paperwork in processing your certification more efficiently. Enrolling in the PADI eLearning Course, in most cases, will NOT save you money, but it will save you time. Rather than being sat in the classroom watching the Padi DVD and taking your exams, you will be straight to the water to practice scuba skills. The cost of the eLearning option is IN ADDITION to the cost of the Padi Course. The advantage for you is the classroom portion of the course can be completed online at your convenience, where ever you are home or work . The disadvantage – you’ll pay a little extra for that convenience.To enrol in eLearning through our store, simply click on the eLearning Banner OR choose our store when you go through the PADI Website. Note: The Cost of eLearning is the SAME at all dive shops anywhere in the world. Ever wonder what it would be like to swim with sea turtles or dolphins instead of rubber duckies and hula hoops? Just putting your face in the water with a mask on will start all your adventures! Once you have completed your Padi Bubblemaker adventures and when you turn 10 years old, you’ll be ready to dive into the deep blue sea and discover cool fish and living marine life with the PADI Jr Open Water Diver Couse! This means you can dive in oceans, lakes and other cool waterways and not just in the pool.Once you complete the PADI Jr Open Water Diver Course, you’re a full-fledged padi certified diver! You can now explore everything the underwater world has to offer -as long as you’re accompanied by another certified diver who is of legal age (like your parents or favourite instructor). 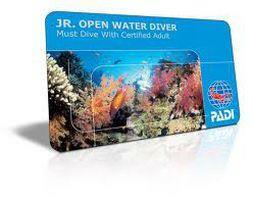 The full certification course giving an internationally recognized diving card. Depth limitation depends on age Minimum age 10. All dives limited to 12m max. Age 12+ the 3rd and 4th dives may be to 18m max depending on your instructor.Padi DVD Videos, theory sessions and confined water work are used to promote your knowledge of diving safety. In approximately 3 – 4 days you will have gained the skills and knowledge necessary to plan and conduct dives in conditions equal to or better than those you were training. In certain conditions, you will not require professional supervision, although in most areas, using the services of a competent dive guide and any Padi Dive Centre will improve your enjoyment of the dive sites immensely.Four training dives are part of this course allowing you to practice your skills successfully in deeper water. This repetition of skills will help build your confidence in your ability to handle routine events in any depth up to 18m.When you turn 15 years old (The legal diving age), you can upgrade to a FULL PADI Open Water Diver certification.Don’t let the adventures stop there? Make the move to the Advanced Openwater diver. Now is the time to dive in, PADI Open Water Diver course, the most popular dive program in the world! This is your ticket to a lifetime of intense adventure and fun with PADI, a dive company that sets the standards in the global diving community. Throughout the Padi open water course in cyprus, you’ll learn fundamentals of scuba diving, including dive equipment and techniques. You will also earn a PADI Open Water Diver certification that is recognized worldwide. You earn this rating by completing five pool or confine water dives and knowledge development sessions and by making four open water in the sea. As a certified PADI Open Water Diver you have the freedom to dive with a buddy independent of a professional. If you already tried a PADI Discover Scuba Diving experience or are PADI Scuba Diver certified, check with your instructor to see how credit from these courses may apply to the open water program. Your underwater adventure can begin as soon as today with the new PADI Open Water Diver Video and interactive Padi eLearning Touch! You can view these materials at home, at your own pace and then meet with an instructor for further assistance. 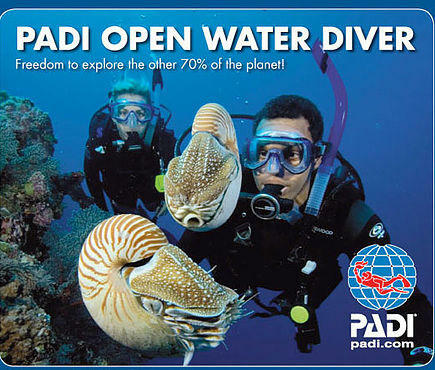 Padi Open water learning options also include group or private instruction. This course offers tremendous flexibility and lets you work out individual needs with your instructor. Virtually anyone who is in good health, reasonably fit, and comfortable in the water can earn a PADI Open Water Diver certification. If you are between 10 and 14 or have a child between these ages, there is a PADI Junior Open Water Diver Course available.